Recently, people have been asking me, “What can we do to increase voter turnout among millennials?” I typically respond: change the nominating process to a binge-worthy reality TV show where the American people select their choice via a rose and, like “The Bachelor,”get divorced after four years. It did get me thinking though. 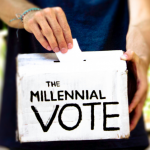 Short of a reality TV show, how do we increase millennial turnout? There are many stereotypes about millennials. We are perceived as lazy, enjoy binge-watching Netflix and are self-absorbed. Above all, we are viewed as politically uninvolved. The oldest millennial was born in the early 1980s and the youngest in the late 1990s. Some sources even consider those born in 2000 to be millennials. Millennials are digital natives, are immersed in social media and obtain news from social media and online sources. Millennials are also unique in that we are the most educated generation, as well as the most racially diverse generation. We believe Washington is broken. According to a Harvard Institute of Politics survey, 43 percent of millennials do not think it matters who wins the election because Washington is just that dysfunctional. Unlike our parents and grandparents, we are not fans of party politics. In fact, 50 percent of millennials are independents compared to 39 percent of Generation Xers, 37 percent of Boomers and 32 percent of the Silent Generation. No one can blame millennials for feeling this way. After all, the oldest of the millennials were forming their views on politics during some of the most turbulent times in recent history. Consider this: the oldest millennial, born in 1980, voted for the first time in 2000. Which means our first exposure to the electoral process was Bush v. Gore, a frustrating time for both Democrats and Republicans. Furthermore, the structures in place to allow fair elections deteriorated. A discrepancy between the popular vote and the electoral vote led to counts and recounts. Ultimately, the Supreme Court had to get involved. What a memorable first time election story! Millennials’ next encounter with politics were the tragic events of Sept. 11. No amount of helicopter parenting could have kept millennials blissfully unaware of this act of terrorism. In fact, many of us were 10 years old or older. We trusted our political leaders to obtain justice when we entered Afghanistan. We were told there were weapons of mass destruction (WMD) in Iraq. More than a decade later, no WMDs were discovered and millennials witnessed one of the longest, costliest wars in American history. Millennials also came of age during a period of rapid rise in income inequality, the Great Recession, massive student loan debt and a lack of employment opportunities. In addition, we cannot forget the systematic failure of various levels of government during Hurricane Katrina. It is no surprise we are skeptical of politics, register as Independents and reject party politics. According to the U.S. Census Bureau‘s analysis of presidential elections from 1964-2012, younger adults have consistently had the lowest turnout. While it is true that 18-24-year-olds have experienced a decrease in voter turnout over time, every age group has seen decreasing voter turnout. We also seem to believe millennials and young voters (18-24-year-olds) are the same. In reality, millennials stretch across two voter blocs: the 18-24 and 25-44-year-olds. There also does not seem to be enough data to make a solid conclusion. We can assume millennials will be like other young adult voters. However, the youngest millennial will be voting for the first time this year, so our data is incomplete. Given that the trend is for individuals to become more politically engaged as they get older, perhaps waiting a few years before concluding that millennials are the least politically engaged generation might be warranted. At the very least, we should wait until all millennials have had a chance to vote and give credit to the older millennials in the 25-44-year-old voting bloc. Millennials are generally politically engaged and aware. We are avid consumers of online news and participate on social media. We volunteer more than any other generation and spend our money at stores that help address social injustices. We are the most educated generation, which means we are often away from home and in college the first time we are voting. Reducing barriers to voting is one way to ensure millennials become engaged. Having access to absentee ballots, allowing same-day voter registration and making college IDs a valid form of ID to vote would make it easier for millennials to participate. Millennials are clearly skeptical of the establishment, which is why we overwhelmingly support outsider candidates such as Bernie Sanders, Donald Trump and Ben Carson. Open primaries that would allow us to nominate a candidate without having to commit to a party would motivate us to show up to primaries and caucuses. If one of our outsider choices were nominated, perhaps we would vote during the general election. Millennials also seem to prefer policy-driven debate. We have no loyalty to parties, candidates or even government—we just want results. The more we focus on millennials, the more we fail to see the bigger problem. We need increased voter turnout among all voting blocs. Just give us some time to get out and vote! Author: Laura Caccioppoli is a millennial and a recent graduate of Villanova University with an M.A. in political science and a graduate certificate in nonprofit management. She currently works at University of the Sciences and is a board member at The Consortium in Philadelphia. Her research interests are in health and food policy, cultural competency and social justice.